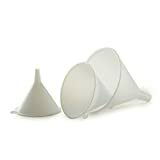 Every kitchen will benefit from having these handy funnels that come in 3 different sizes! Large Mouth: 4"/10cm Stem: .5"/1.25cm; Medium Mouth: 3.5"/9cm Stem: .4"/1cm; Small Mouth: 2.5"/6cm Stem: .3"/.75cm. A simple, yet helpful tool for transferring liquids/dry ingredients from containers to bottles while keeping the kitchen counter free from spills. Each funnel has a perfectly narrow spout which fits into majority of bottle necks, to avoid spilling and also comes with a convenient loop on the side for hanging up when done. Also great for auto care, cleaning, restaurants, schools and labs! 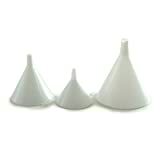 This set of 3 durable plastic nesting funnels give a good range for most needs and are easy to clean. Top rack dishwasher safe. 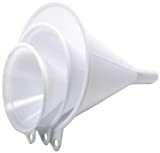 Every home and kitchen will benefit from having these handy funnels that come in 3 different sizes! Large Mouth: 4"/10cm Stem: .5"/1.25cm; Medium Mouth: 3.5"/9cm Stem: .4"/1cm; Small Mouth: 2.5"/6cm Stem: .3"/.75cm. 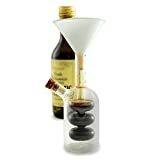 Interested in the Nopro Plastic Funnel, Set of 3? Is the price too high? You can easily price watch this product and we'll notify you when the price reaches your target.